I love when I walk into the meat market and the butcher tells me what's on sale because it provides such inspiration! Plus, I like to save a buck or two! Who doesn't, right?! If you've never had a sirloin tip roast before, you're missing out. They are super lean and cook up beautifully! This recipe is fool proof. I mean, seriously, it's one of my easiest recipes to throw together, so ANYONE can do this! Place the potatoes and half of the garlic cloves into the bottom of your crock. Next. place the sirloin tip roast on top and salt and pepper well on both sides. 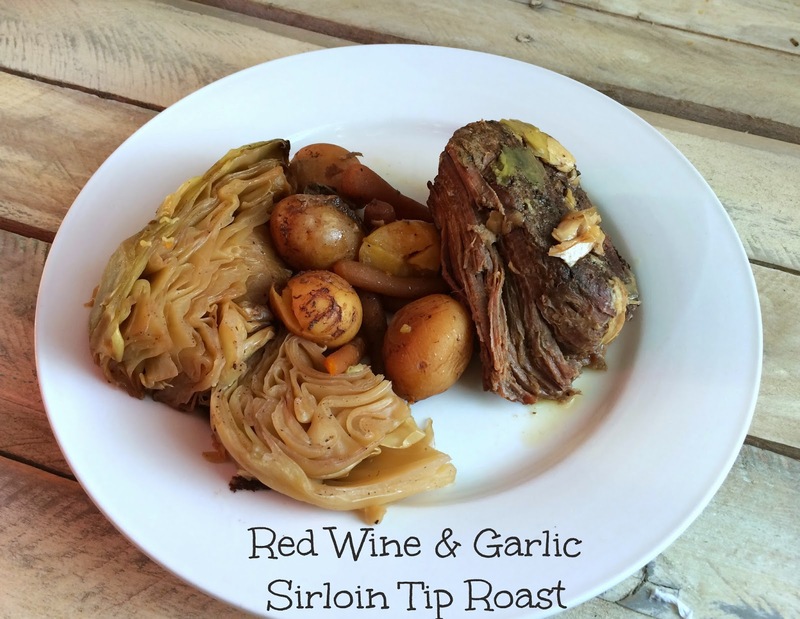 Place the remaining garlic cloves on top of the roast. Place the carrots around the roast. Place the cabbage on top and salt and pepper it. Pour the red wine over the top.